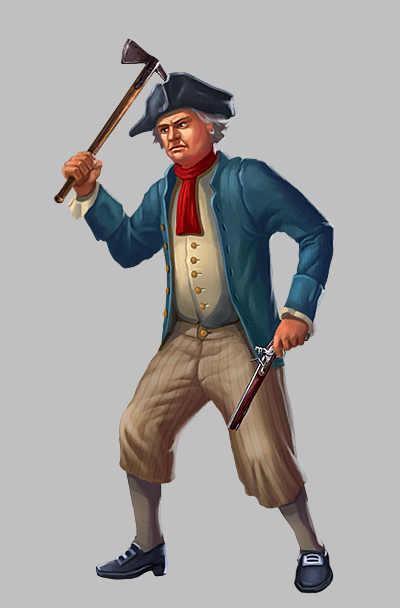 In her adventures as a highwaywoman, Shadowhand has to fight for justice on a regular basis. 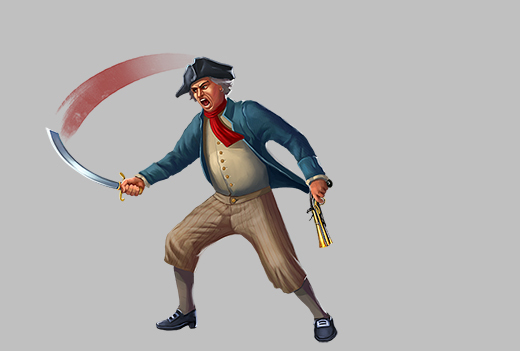 As well as coming across land-based enemies, she may also fall foul of sea-going foes. 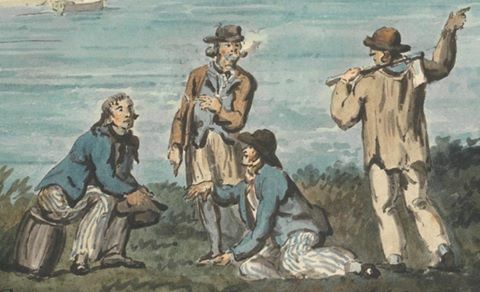 Smugglers were incredibly common, and plied their trade along the moonlit shores of the English Channel in the late 18th century. Britain was also busy building its empire and had created a strong navy. 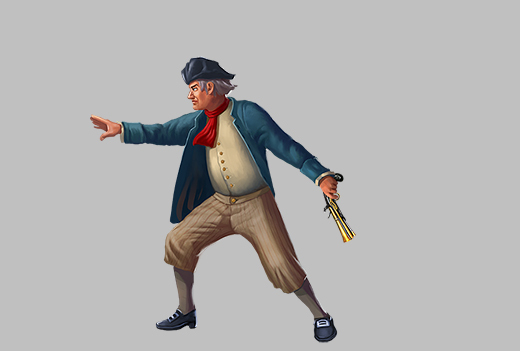 Our Sea Tar character is based on a stereotypical sailor type, sometimes known as Jack Tar. Here is an illustration of a few from 1770. But as the game progresses we see him gradually upgrade his melee weapon to include a Boarding Axe. This was a weapon used by sailors boarding ships in a combat situation, and it is a lot like a tomahawk. The Sea Tar also uses guns. He starts out with a Sea Service Pistol, which later gets upgraded to a Firebomb Blunderbuss. 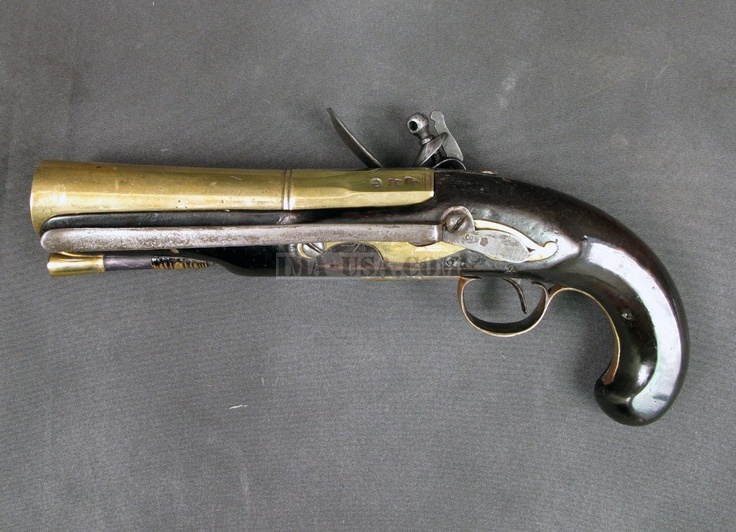 What makes this pistol so interesting is the large size of the bore, an inch and a half at the muzzle, sounds small but it isn’t! For the size of the pistol the bore is enormous! From what research has been done we suspect this was a British Naval Specialized weapon intended as a pyrotechnic devise that could fire a flaming projectile onto the sails of an enemy ship. The recoil would not have been as substantial hence the diminutive nature of the grip. 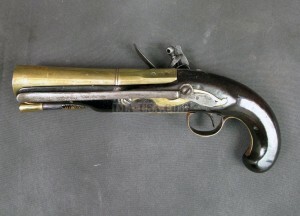 That being the case, this pistol is extremely rare and may have seen service at some of the great Sea Battles of the era including The Battle of the Saints 1782, Howe’s Victory Glorious of 1795, Nelson’s Battle of the Nile in 1798, the Battle of Copenhagen in 1801, and of course Nelson’s Battle of Trafalgar in 1805. 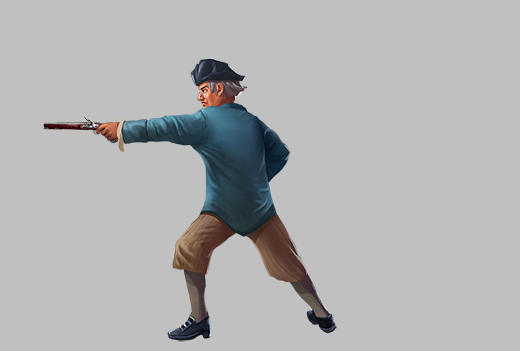 Shadowhand also has the ability to wield all of these weapons – if she can beat him and get her hands on them! This entry was posted on Thursday, January 5th, 2017 at 3:36 pm and is filed under Developer Diary, Grey Alien Games. You can follow any responses to this entry through the RSS 2.0 feed. Both comments and pings are currently closed.